Two explorers are surrounded by weird flora. 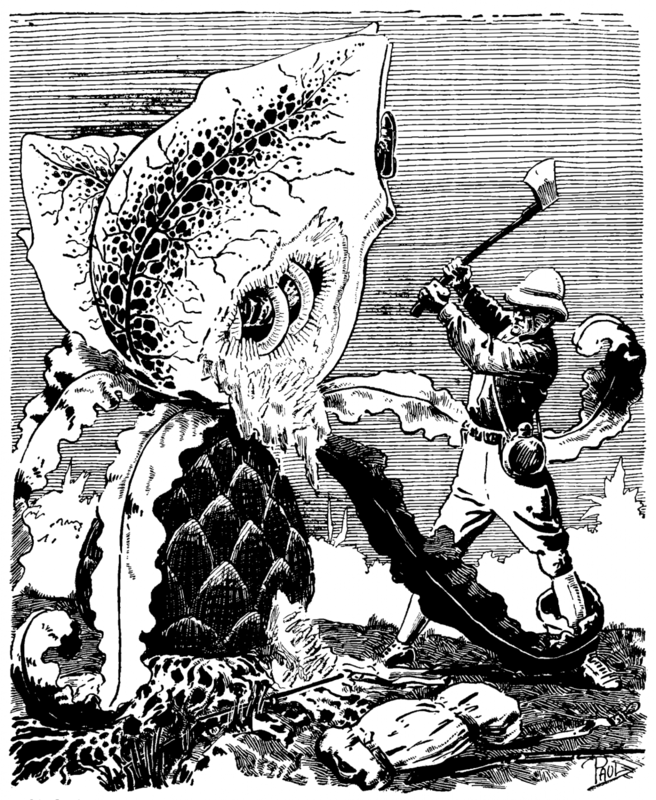 One man reacts with shock as he watches his companion being hoisted into the air by a pair of tendrils which emerge from inside a gigantic plant – a plant large enough to contain a human being. It was September 1927, and Amazing Stories had taken a somewhat macabre turn in its latest batch of tales. 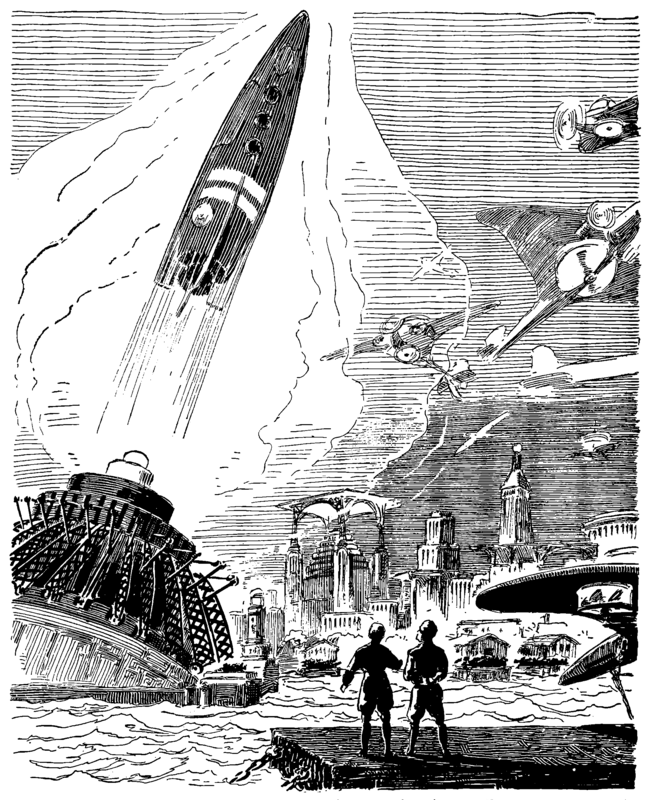 Hugo Gernsback’a editorial this month offers a debate about time travel. It opens by quoting a letter sent by one C. G. Portsmouth about Cecil B. White’s “The Lost Continent”; this correspondent finds scientific implausibility in White’s tale of time-travellers observing ancient Atlantis; not in that such a trip took place, but in that the locals were able to see the travellers. “It is scientifically possible for 1926 to go back in time and observe its doings, etc, of 14,000 years ago (theoretically, I mean, of course),” writes Portsmouth, “but it was not theoretically possible for that race of 14,000 years ago to sense in any way those who watched them”. “They necessarily lived and died thousands of years ago, and yet when their time is brought back again they are made to observe and act in a manner they could not even theoretically have done […] The writer of the tale had a chance there of propounding an interesting bit of science by having some of the people on the ship asking how it was that none of the throngs of Atlantis below seemed to notice them in any way and then having it explained to them, as far as the people of Atlantis were concerned, the ship, the sphere and the explorers in time simply did not exist—could not exist, because these people had already lived through this moment of time once when there was no ship, no sphere, and no travelers-in-time, and were now simply reliving that same moment of time again”. 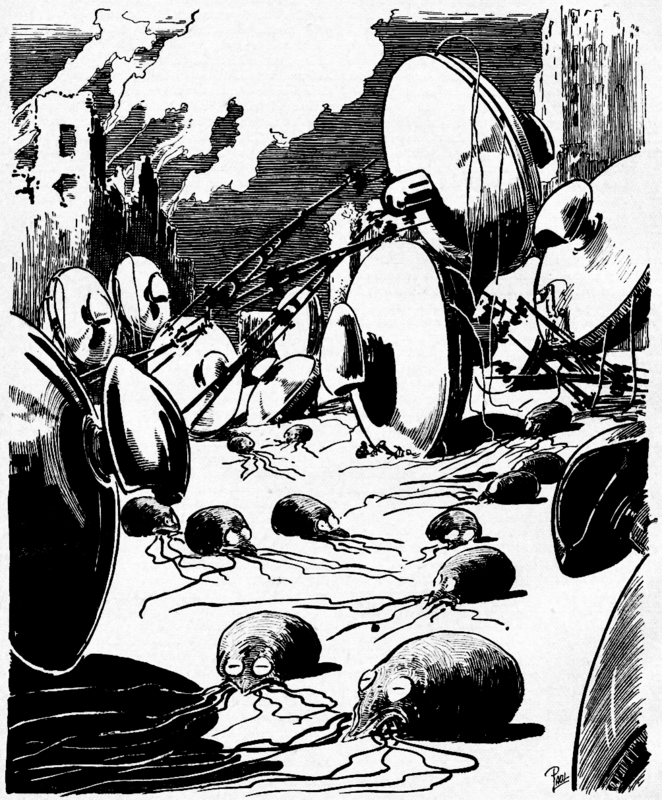 Gernsback responds by taking his usual stance on matters of plausibility (“Many things that sound perfectly illogical today may be perfectly logical tomorrow, in the light of more and better knowledge”) before citing H. G. Wells’ recent article “Explorations in the World of Dreams”, in which Wells argues that the human mind exists simultaneously in the past, present and future; the editor also notes that we can look into the distant past simply by observing the night sky. Rather like some of the letters in the July 1927 issue, this exchange shows how readers of the era approached time travel stories rather differently to their modern counterparts. Decades ago, a meteorite had landed in the area near a well. Researchers investigated the rock and found a number of bizarre properties, not least an ability to glow in hues “unlike any known colours of the normal spectrum”. Over time the meteorite deteriorated until nothing remained but its malignant influence: it caused the town’s crops to grow into mutated abominations, once again in otherworldly colours, and had a similar effect on the local fauna. Worse, a family called the Gardners were struck down with debilitating illnesses that first cause mental deterioration, and then bring about unspeakable bodily transformations. “The Colour Out of Space” is an example of how Lovecraft secularised supernatural horror, in this case by taking the familiar Gothic motif of the cursed family and applying it to a quasi-scientific backdrop of radium poisoning (the subject of a then-recent scandal). Although Lovecraft’s prose could sometimes become purple, this story shows a flair for the succinct (“The swine began growing grey and brittle and falling to pieces before they died”) and an ability to evoke one eerie, haunting image after the other. This sequel to “The Malignant Entity” (published in the June 1926 Amazing) continues the adventures of paranormal investigator Dr. Dorp; but while the first story offered a weird mixture of science and the supernatural, with a dead man’s consciousness possessing synthetic protoplasm, “The Radio Ghost” takes the more straightforward path of rationalising its ghostly occurances. Dr. Dorp is visited by Greta Van Loan, the niece of a deceased friend. It turns out that her uncle willed his fortune to her on the condition that she spend a year in his old home so that his spirit can communicate with her. There, she heard mysterious sounds and felt an icy breeze, prompting her to call on Dr. Dorp to investigate. Dorp and his Watson-esque assistant Evans head to the house, and it is not long before seemingly supernatural events start to occur: first a poker moves apparently by its own volition, and then a spectral figure manifests. After this, Evans finds Dr. Dorp unconscious from shock. The household dog suddenly goes into a frenzy and attacks Evans until Greta shoots it dead. Recovering, Dr. Dorp suspects foul play and tracks down the culprit: Ernest Hegel, Greta’s cousin, who was trying to get the dead man’s inheritance money for himself. Hegel conducted his misdeeds from a hideout eight miles away, but kept his eyes and ears on the house using microphones and a primitive form of television. 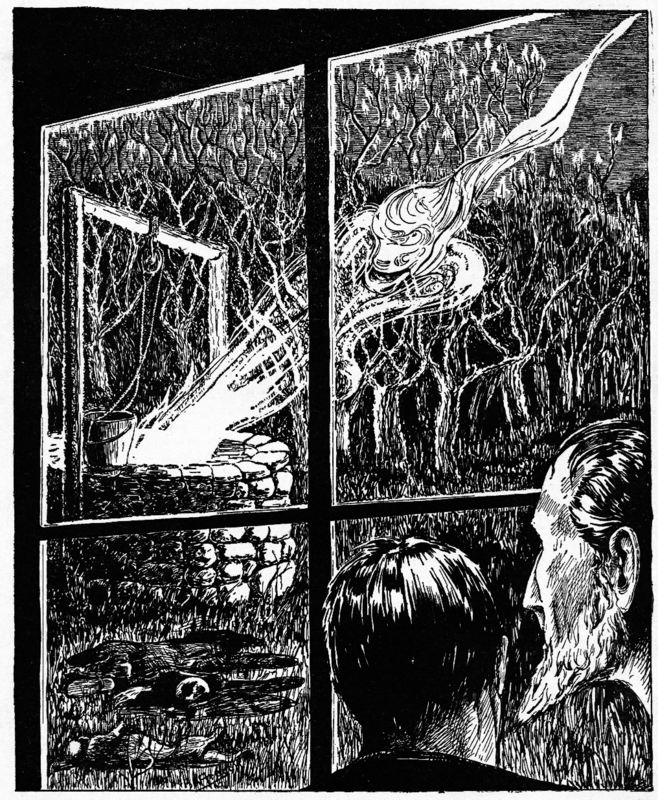 The dog had been deliberately infected with rabies by Hegel; the flying objects were the work of magnets; the icy breath that spooked Greta and placed Dorp in a state of shock was dry ice; and the ghostly apparition was no more than phosphorescent gas. If only Hegel had put his remarkable ingenuity to honest use providing special effects for TV! Professor Münster, a museum curator, meets up with a man he had not seen for twenty years: Ronald Jarvis, who had accompanied a previous curator named Schlecting on an anthropological expedition in Quebec. The pair discuss this trip, which involved a search for a tribe of “white Indians” who were reported to worship an eternal fire. During their journey Jarvis and Schlecting encountered a man who apparently belonged to their tribe, and who warned them against progressing further. 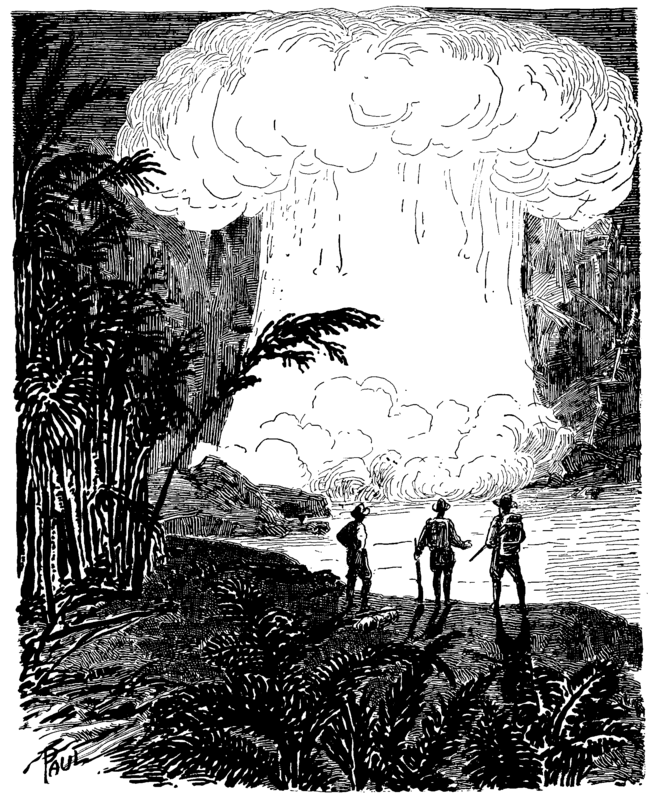 Undeterred, they pressed on to a volcanic region and witnessed the fabled “mushroom of fire… Niagara Falls turned to fire and inverted”, a phenomenon resulting from a constant stream of ignited gas. These reminisces are shot through with melancholy, as the two speakers are fully aware that Professor Schlecting is now dead. The narrative carries on, and Jarvis reveals that the expedition reached to a region inhabited by prehistoric survivals including a Pterodactyl and an Allosaurus. Jarvis survived an attack by the latter creature, but at around the same time Schlecting went missing; the two speakers have a small debate as to whether he was slain by the same dinosaur that attacked Jarvis. Jarvis goes on to relate how he spent twenty years in the care of the “white Indians”, and even married a woman of the tribe. Münster speculates that these people were descended from Norwegian travellers, partly because they referred to the Allosaurus as Jormen – recalling a sea serpent of Norwegian lore. Over the course of the two decades, the tribe dwindled from the effects of tuberculosis, dwindling from three thousand to three hundred members. Finally, a volcanic eruption forced Jarvis to leave. Münster asks for evidence to back up this narrative – which, after all, may be no more than an elaborate cover story to hide Jarvis murdering Schlecting for his money. Fortunately for him, Jarvis is able to produce an unfossilised trilobite shell. Using a variation of the gun-propelled vehicle concept popularised by Jules Verne in his lunar adventures, this story posits a future where vessels launched from gigantic cannons are regularly used as a method of passenger flight faster than conventional aircraft. In the water, it hits a rusted-up World War I-era submarine – with bizarre results. The impact awakes an occupant of the submarine, one Lieutenant Commander Roger Wells, who had been lying in a state of suspended imagination for two centuries. Rescuers arrive to try and retrieve Henrietta’s projectile, and encounter the revived submariner along the way. Despite feeling like a relic in this strange new era, Roger possesses a hands-on knowledge seemingly missing from the modern world, and hits upon a way of blasting the projectile out of the sea using radium. Once rescued, Henrietta falls in love with Roger and decides to marry him even if it means subverting society’s eugenic regulations (“if she married a man of her own intelligence, the chances are her children would be fools or abnormal in some way”). Thoroughly dated in terms of both technology and social attitudes, “The Tide Projectile Transportation Co.” is if nothing else a pristine time capsule. In this story by a German author, traveller Sir George William Armstrong meets a yogi who tells him of a small valley in the Himalayas that is purportedly inhabited by demons. Sir George and his companion John Bannister travel to the valley and find not demons but enormous plants – species that seem to Armstrong so strange as to be almost demonic. In the middle of a glade is a flower nearly ten-feet in height, which suddenly grabs Sir George with an internal appendage and swallows him. Bannister hacks the plant open to save him; George turns out to be alive, but so traumatised that he later dies in an insane asylum. But then the awful thing came to pass. The flower slowly opened, and something bright and flesh-colored shot out of it. What darted so suddenly? Was it the sucking arms of an octopus? Was it the soft arms of a woman? From Sir George there came a scream that cut to the very marrow, and John Bannister, frozen stiff with fright, saw his master lifted by his shoulders, up, higher and higher, saw him hanging for a couple of seconds in uncertain balance, and finally disappearing slowly into the calyx of the atrocious, malignant flower, whose petals once more drew themselves together with a start. In this way Sir George celebrated a symbolic marriage with nature, a festival more overcoming, but also more horrible than that for which he had prepared himself. Over the whole scene horror seemed to sweep on dark bat’s wings. The magazine takes pains to make a case for the botanical plausibility of this story. 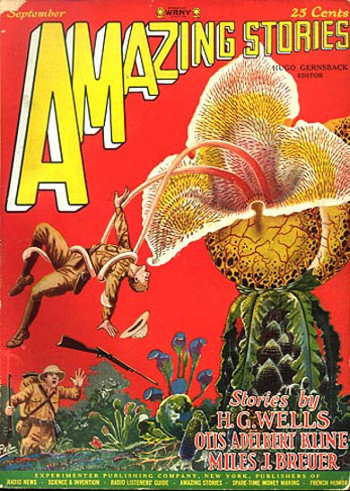 The editorial introduction stresses the existence of plants that can eat small mammals; while printed alongside the story are a photograph illustrating the cross-section of an insectivorous plant, and a short article reprinted from Science and Invention about large flowers such as the Amorphophallus titanum. A pair of workers from an Italian electric plant each fall in love with the superintendent’s daughter, and decide to fight a duel for her hand. 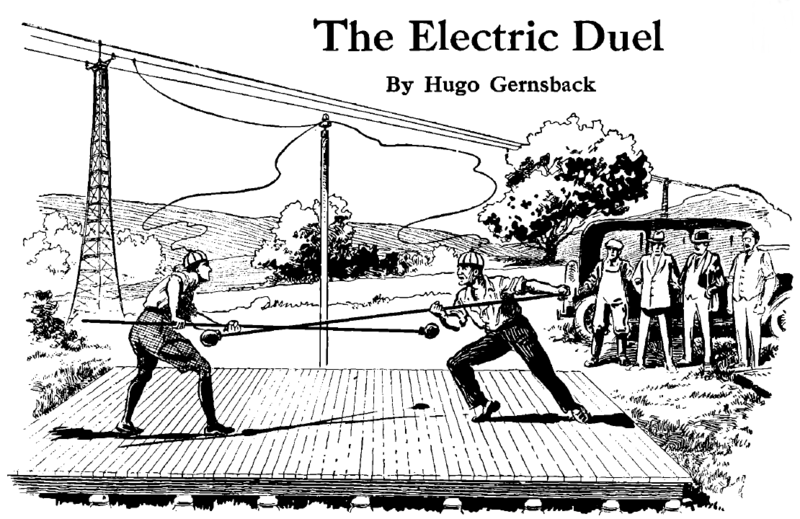 The two engineers agree on an unorthodox method: they hold their duel on an elaborate deathtrap that will electrocute whichever one falls over; their weapons are poles which they use to knock each other to the deadly platform below. The duel ends in a terrible draw as both men knock each other over at the same time. Accompanied by his friend Brian, the narrator of this story visits an acquaintance, one Dr. Fleckinger. There, the doctor performs an unsightly act: he applies a greenish-black substance to his arm, causing the flesh to blacken and shrivel; he then slices off the affected portion of flesh and carries on with his work. 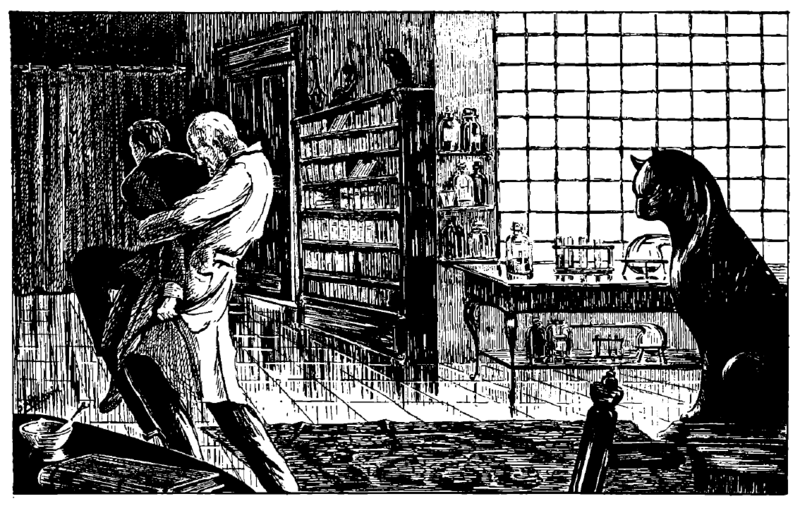 The protagonist explains to the reader that such behaviour makes him uncomfortable around the doctor, despite their friendship. Before they depart, the doctor shows the two visitors a stone cat. This object produces strange reactions from those present: the narrator finds it disconcerting, the doctor’s daughter Lila shudders at the sight of it, while the three-year-old daughter of the housekeeper breaks into tears. Shortly after this visit, Brian disappears. The narrator recruits a detective nephew, Richard, to find his missing friend. 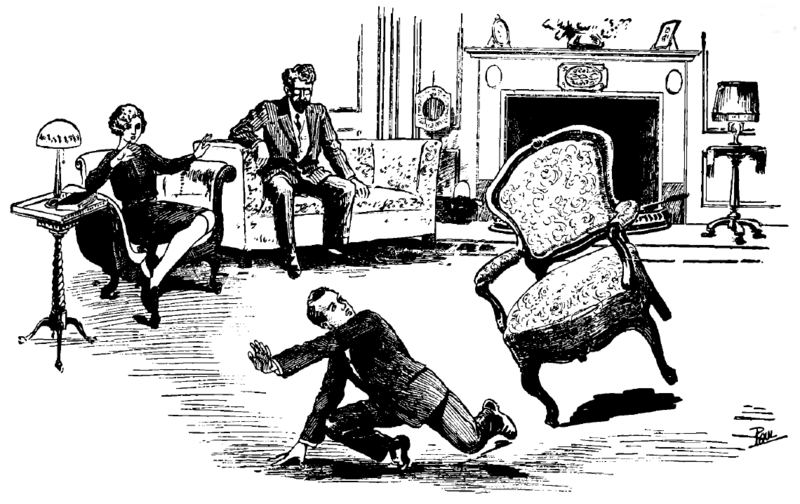 The sleuth later announces that he has found the answer, and takes his uncle to the doctor’s home. There, Richard points out a statue, posed in the manner of Rodin’s Thinker – but with the face of Brian. Dr. Fleckinger finds them, but after a scuffle, Richard succeeds in throwing the doctor into a vat of the mysterious liquid. Then, using a frog, the detective demonstrates how the liquid can turn living beings into statues: the fate that befell the child’s cat, Brian, and now the doctor himself. A brief story built around an effective but not particularly original image. The concluding part of Wells’ immortal invasion narrative begins in the middle of the apocalypse. The protagonist is placed in such dire straits that he is forced to kill a fellow survivor, although he finds time to contemplate the workings of the Martians and their various machines; he theorises that the aliens may once have been closer to humans, but their evolution forced them down a strange path as they grew increasingly dependent on their technology. The famous conclusion sees humanity’s apocalypse averted by a second, unexpected apocalypse that affects only the Martians. The War of the Worlds is one of the truly canonical works of science fiction, and its influence on the field will be felt for generations to come. Its brooding conclusion is also an appropriate addition to an Amazing Stories issue which has – between extraterrestrial diseases, chemically-created spectres, man-eating plants, electric deathtraps and people being turned to stone – been rather morbid in its choice of subject matter. This month’s letters column begins with Dwight B. MacCormack reporting an encounter with an adolescent Amazing fan at a cigar store (“My mother doesn’t like it though because my father stays up all night reading it”). Meanwhile, the contest entries inspired by the December 1926 cover are still being discussed. Alfred H. Richards praises Cyril G. Wates’ entry “The Visitation”: “Mr. Wates so ingeniously reconciles and explains away everything that to me appeared so improbable, and incongruous when I first saw the picture, that if I didn’t know about the contest, I would certainly think it was drawn to fit the story, rather than the story was inspired by it”. Richards does, however, object to the idea of an undiscovered civilisation existing in an area as well-mapped as the South American coast (“If he had chosen some Pacific isle or the Antarctic Continent it would have seemed more probably”) and questions why such an advanced society could not have traversed cliffs or water. He goes on to critique the physics in another entry, “The Electronic Wall”. Frank Kallenberg states that he considered entering the contest himself; but instead of a story, the cover illustration of a floating device inspired him to try out an engineering experiment. This was not a success, but his letter gives the impression that he was undeterred: “I have spent over two hundred dollars in experiments of ideas I have gleaned through the reading of some stories in this magazine”. H. L. Drape praises the contest entries, but complains about some of the other tales in the magazine: “Stories incorporating the ‘Fourth Dimension’ are a kind I do not like. A great many of the would-be scientists try to weave an air of mystery about this topic and their reasoning for the most part is hazy and absurd.” The letter does, however, express interest in stories “embracing different kinds of light rays, both visible and invisible” (“Spirit communication through these mediums always makes interesting reading”). A couple of readers were inspired to draw parallels between fact and fiction. Robert M. Gerfin submits a Philadelphia Enquirer clipping about a newly-discovered variety of tree which reminds him of the arboreal horrors in A. Hyatt Verrill’s “Through the Crater’s Rim”, while 13-year-old Henry Gordon Adamson provides an anecdote from Colliers’ in which someone describes their lamp bulb bursting as they played the violin and simultaneously listened to the radio; the young reader compares this to the lethal note in Ben Prout’s “The Singing Weapon”. Samuel Shackman gives his thoughts on technological progress (“Fifty years ago, who would have thought of seeing a person who is miles away and speaking to him at the same time!”) and credits Amazing with getting the public thinking about the future. He also predicts, correctly, that the magazine “is the pioneer to a flock of such similar works that are to come”. On a more positive note, British reader A. M. D. Pender praises the range of nationalities covered by Amazing: “one thing that strikes e particularly is the international character of the magazine”, he writes. “England, France, and America are equally represented in the stories”. He then goes on to enthusiastically state his familiarity with the real-life locations used in The War of the Worlds. Edgar Luia compares A. Hyatt Verrill’s “The Ultra-Elixir of Youth” to an earlier story on a similar subject, which he does not name, and then complains about both of them: “Why should such an elixir reduce an adult to childhood? If age is merely an exhaustion of cells, what else should a youth-giving potion do but rehabilitate a person by rejuvenating the cells? Is there any foundation for believing that such an elixir would actually reduce the number of cells in proportion as it revives them?” The editorial response is that, as people tend to decease in size as they age, they might perhaps also decrease in size while de-ageing. Finally, J. Graham Shipman expresses objection to what would later be termed hard SF. “Would it be possible to have less scientific descriptions, which are usually uninterpretable to the layman, and more action?” The editorial response politely states that such views “seem not to be shared by a majority of our correspondents and readers”.